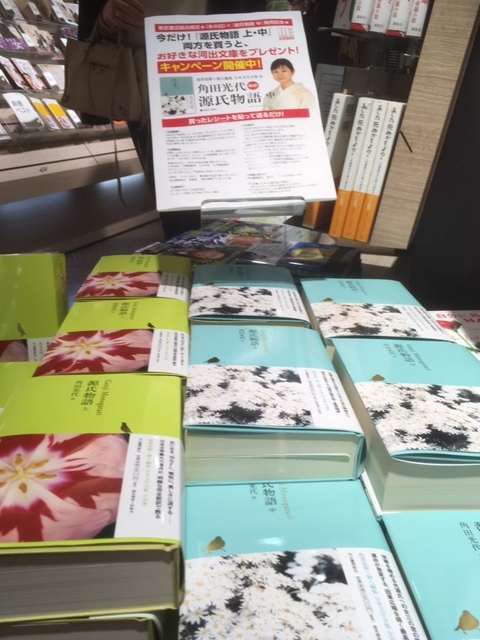 Second volume of a new modern edition of The Tale of Genji by Mitsuyo Kakuta, published 30 October 2018, on sale at a major Japanese bookstore in Tokyo. Photograph: Red Circle Authors Limited. The second book in the three volume new modernised edition of The Tale of Genji, often-described as the world’s first novel, adapted and translated for a new generation of readers by Mitsuyo Kakuta, is now on sale in Japan. The first volume of Kakuta’s edition delighted readers and received critical acclaim, and this is expected to be built on with the publication of book two and book three. The Tale of Genji, written in the eleventh-century by the Japanese noble-woman Murasaki Shikibu (978-1014), is already an international publishing sensation, with translations, spin-offs and adaptations for manga, anime, film and theatre. Kakuta’s new edition will ensure that this continues well into the future. Despite readers needing to wait until next year for the final instalment in the trilogy, Amazon Japan is already taking pre-orders for the final concluding instalment, which is due to be released in November 2019. Kakuta is following in a long tradition of Japan’s leading author from each generation updating and publishing a new version of this “seductive novel” about the Japanese prince Genji set in Japan’s Heian Period (794-1185). A very peaceful period in Japanese history often referred to as the world’s “first golden age of female writers”. This multi-generational trend has helped keep this rather long and esoteric tale, which in its original version consists of 54 scrolls or chapters; around a million words; about 430 different characters; 800 poems; as well as 8 or so love interests, fresh, and relevant to contemporary readers. The first two volumes of Kakuta’s adaptation are both around 700-pages in length, which no doubt led to the strategy of publishing the tale about this shining Japanese prince in three volume instalments over a three-year period. “Murasaki watched the sexual manoeuvrings, the social plots, the marital politics, the swirl of slights and flatteries that went on around her, with the keen, sometimes sardonic, and always worldly eyes of a medieval Jane Austen. Her Buddhist view of life’s fleeting nature and the vanity of human affairs added a dash of melancholy to her ornate aristocratic prose,” Buruma writes in a review, of an English language translation by Dennis Washburn published in 2015, for The New Yorker. It is very apparent from the original version that the tools for seduction in Japan’s Heian Period were art, poetry, calligraphy and style. Unsurprisingly, it took Kakuta considerable time to decide on the right style and rhythm required to make the novel readable, accessible and compelling for today’s readers who are more familiar with online dating than traditional methods of courtship. Her careful and considered approach appears to have worked wonders. Japanese readers are posting comments on social media about how amazingly easy it is to read her version and how her first two volumes read like an original Kakuta novel set over a thousand years ago in Japan’s Heian Period. Despite the numerous deadlines and length of the work and the fact that some of Japan’s most highly regarded writers have published versions for previous generations of readers, Kakuta, who says she didn’t have any special feeling or connection with The Tale of Genji when she embarked on this major project, didn’t feel any particular pressure. The first modern translation edition of The Tale of Genji is said to have been published by the feminist poet and author Akiko Yosano (1878-1942). Junichiro Tanizaki (1886-1965) and Jakucho Setouchi are two other examples of leading authors who adapted and published editions, each reflecting their particular literary style and the times they lived in. Kakuta’s version is being published by Kawade Shobo Shinsha, one of Japan’s leading publishers founded in 1886, and are behind the quarterly journal Bungei, behind the Bungei Prize that has launched the careers of many of Japan’s authors including Amy Yamada (Bedtime Eyes), Akira Kuroda (Made In Japan) and Risa Wataya (Install). Kakuta, a very prolific author who is still not well known outside Japan but often referred to in Japan as one of the country’s best and most widely read writers, has had to put all other major writing projects on hold since 2015 to focus on this new three volume edition of The Tale of Genji. The publication is a part of a special project, an Anthology of Japanese Literature, supervised by Natsuki Ikezawa, one of Japan most prominent literary figures, and is being promoted aggressively by its publisher. More information in Japanese on Mitsuyo Kakuta’s Tale of Genji is available here. Mitsuyo Kakuta is a skillful and prolific author whose works instantly captivate. 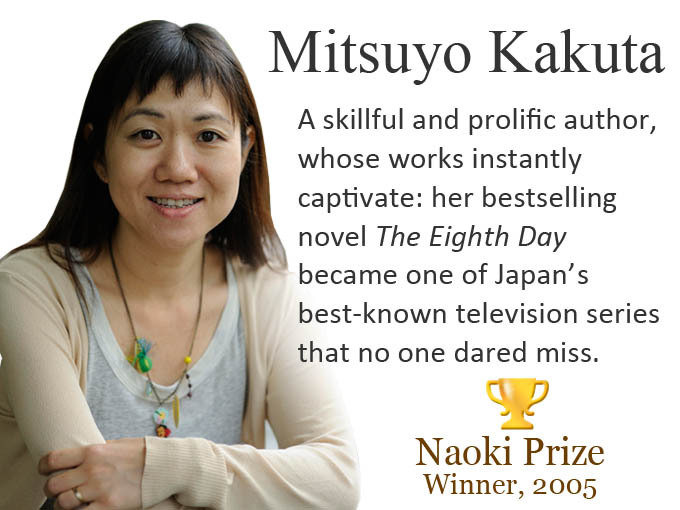 Her bestselling novel The Eighth Day became one of Japan’s best-known television series that no one dared miss. Her first novel Kofuku na yugi (A Blissful Pastime) written while she was still a student at university in Tokyo won the Kaien Prize for New Writers. She has gone on to win numerous Japanese literary awards and is now one of Japan’s best-known contemporary authors.